Deciding when and how to move a child from cot to bed – and what sort of bed to move them to – can be surprisingly difficult. But parents no longer need to lose any sleep over it, thanks to a new app. Some toddlers transfer to a bed before their second birthday; other parents hold out until the last possible moment. It will often depend on family circumstances – for example, needing the cot for a new baby – but experts say there are several other factors parents should consider. Latest available figures show 879 Australian children from birth to four years old were admitted to hospital with injuries from cot or bed falls in 2010-11. Many, many more were treated in emergency departments. And these are just the tip of the iceberg, according to Sids and Kids national manager of health promotion and bereavement support Jill Green. 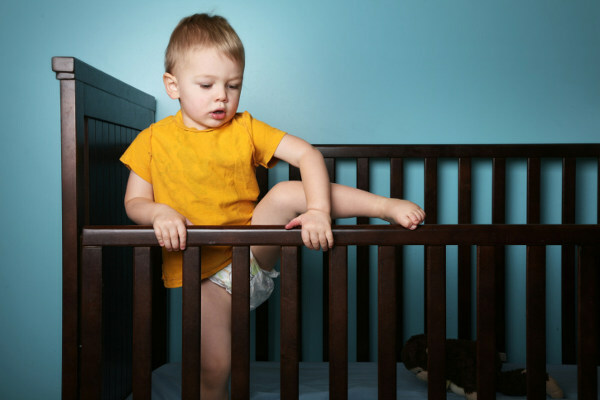 Sids and Kids says many of those falls may be a result of children being moved into an adult bed too early or being placed in an unsafe sleeping environment. Last December, a Victorian inquest heard a toddler died from asphyxiation after becoming stuck in bed rails that were too wide. The organisation last month released its Cot-to-Bed Safety app and downloadable brochure to help parents recognise when their child is ready to move to a bed, what type of bed to use, and how to make the transition safely. It hopes to help curb the number of children injured in bed falls each year. Ms Green says a major concern is that, unlike cots and bunk beds, there are no safety standards for toddler or standard adult beds, or for safety rails. “We need to ensure parents are aware to what they are placing their toddler into if they come out of the cot,” she says. She says most children move to a bed between the ages of two and three-and-a-half, but some toddlers are ready as early as 15 months. “The time to move a baby is when they are looking like they want to start climbing out of the cot,” she says. But sleeping in a bed brings new dangers. For one, curious toddlers have a newly unconfined environment – so it’s vital to do a new child-proofing sweep of the house. Ms Green says some toddlers may be safest on a mattress on the floor to start with. Beds should be away from walls to stop children falling into gaps, and Sids and Kids discourages beanbags or pillows anywhere around the bed before the age of two. Even sleepwear needs to be considered. “If a little one’s wearing a sleeping bag, if they get up to move it’s easy for them to fall over like they are wearing a potato sack,” Ms Green says. But don’t all this give you any sleepless nights – all the info you need is available via the free app for the iPhone at the App Store or Android at Google Play, or download the brochure at Sids and Kids.